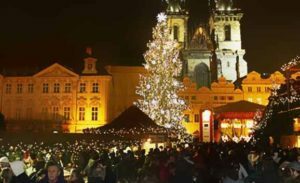 If you are looking for an exciting weekend away either before Christmas or during the Christmas holidays then what better place to go other than Prague? Visitors from all over the globe make an annual visit to this enticing city where festivities are something of an overhaul and a place where both children and adults can enjoy some fun Christmas shopping. If the markets aren’t on your bucket list then add them now because you can experience beauty, Christmas carols and an atmosphere that you really can’t find anywhere else. Locals and tourists join together every single year to create a beautiful wonderland setting that lights up the city night and day. If you are wondering what to fill your suitcase up with then have no fear because there is literally something for everyone. The markets are made up of decorated huts and contain everything and anything you can imagine. Starting from traditional handcrafted items such as glassware, jewellery, embroidered and personalised lace, traditional wooden toys, ceramics and scented candles all the way down to handmade dolls, tree ornaments and decorations and even scarves and hats. You can find some amazing personal gifts to buy here and you might even find something for yourself. One of the most popular buys is Bohemian Garnet. This is the only place in Europe that you can find these stones. They are red in colour and cut into various shapes. Bohemian crystal is yet another famous item to find here. People travel from all over the world to purchase it and it is one of the clearest crystals in the world. When purchasing items like this browse around the stalls because you might be able to barter for it cheaper elsewhere. The markets aren’t only about handcrafted items but this is a place where you can purchase clothes, bags, home ware and anything that you think you need. As well as all the shopping you can do there are some great places in the market where you can stop by and see some of the traditional food being made. You can fill up your belly and sample local produce, taste some ham which has just been freshly roasted on the pit before relishing in a sweet sugared pastry straight from the oven. Don’t forget that with good food comes good drink and while you are mulling over which gift to buy next try some of the famous beers from Czech or even try some of their famous hot mulled wine known as svařené víno. Don’t forget to grab some famous hot chocolate for the little ones too. Taking the whole experience to the next level there is even a petting zoo for the little ones. Here you will find the one and only Bethlehem scene from the bible with sheep, goats and even a donkey. You can also walk to the Old Town Square and get a mighty look at the famous Christmas tree which makes for a spectacular sight and it will get any old grinch into the Christmas spirit! School choirs will make your experience even more memorable and they take part in singing Christmas carols throughout the day and early evening. The festive atmosphere here will wishing you never had to go home. The Old Town Square market is probably the prettiest and the busiest of them all. A stage is erected in the centre where festive concerts and shows take place throughout the day and this is the final resting place of the famous Czech Christmas tree which must be visited. Every evening at 5pm the stalls are lit up and make for a beautiful setting in a beautiful country. This market takes places from November 26th – January 1st and opens at 10 AM every day and continues on till 10 PM. The food stalls are usually open until midnight. Wenceslas Square is the next one down to The Old Town Square and again is dominated by a large and beautiful Christmas tree. All the stalls are lit up at night and this is the place where you can really get in touch with the locals. This market takes places from November 26th – January 1st and opens at 10 AM every day and continues on till 10 PM. The food stalls are again usually open until midnight. 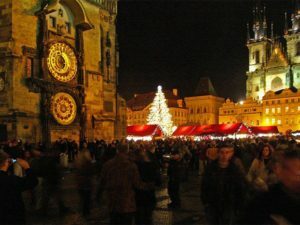 All over Prague you will find smaller Christmas Markets to venture through. In Republic Square you will find a smaller sized market which is actually within walking distance of Old Town Square and opens on November 25th until December 24th. In front of the famous church – St Ludmila the first and foremost market opens on November 29th. This market can be found in the area known as Peace Square. This is beautiful market to visit and isn’t the top choice for tourists so you can pick up some beautiful local bargains here. The market stalls open at 10 AM and close at 7PM. 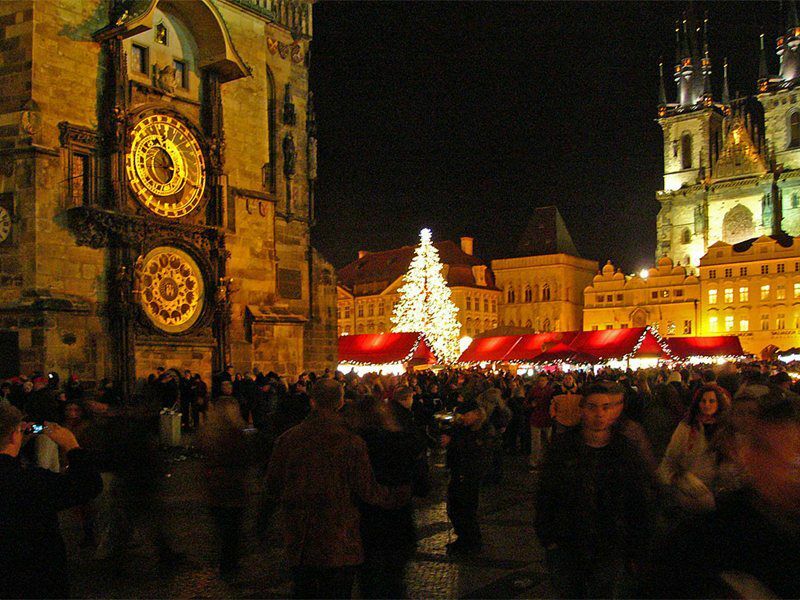 At the Holešovice Exhibition Grounds you will also find yet another Christmas Market. This is a pleasing market and isn’t too overwhelming on the legs. Here you can find weekend entertainment for both the adults and the children. Christmas is the time of year when friends and family gather and take joy in the festivities. It is a time of peace and relaxation and if you haven’t visited the markets before then do so this year. Book a hotel in advance because the book up pretty quickly for December and enjoy a weekend in pure paradise, a heaven for all festival lovers. Eat good food, drink good wine and purchase some stunning, handcrafted items which locals spend hours and hours of their time creating. Don’t forget to take a snapshot of the beautiful Christmas tree in Old Town Square before exploring the smaller markets for a more intimate experience. Take pride in buying some special gifts for your loved ones and enjoy the atmosphere that Prague offers its guests. Treat yourself to an early Christmas present and pick up some beautifully crafted, luxurious leather gloves. Enjoy a romantic walk around town while taking the time off to not think about the daily grind that life throws at us every day. Spend some of that hard earned money, have fun, be inspired and have a merry, merry Christmas.